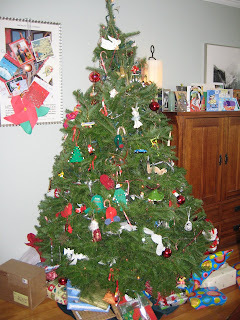 We had a lovely Christmas here at Ferretworld. It started early...but not as early as Adam intended (he had to be sent back to bed twice before 6am!). 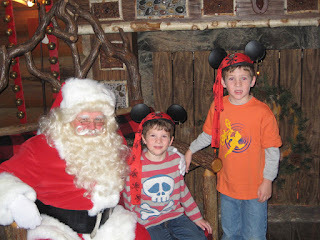 Santa did come, despite some concerns that he might leave only coal... 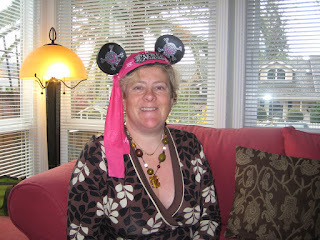 Here I am modeling my princess pirate ears as chosen by the boys. 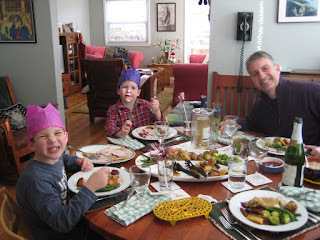 We ate too much, but it was good (thank-you WholeFoods!). 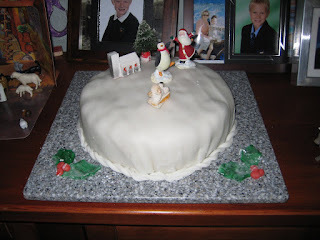 Finlay now knows the figgy pudding song so was able to sing in the pudding! I hope your holiday was as happy and comfortable as ours. Merry Christmas* one and all! 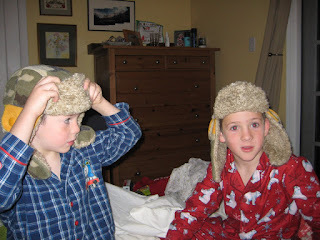 Having got back from Bear we were finally getting ready for Christmas. Unfortunately we got back to discover that someone had stolen our illuminated reindeer from the front lawn. I assume it was kids because the reindeer were in such poor repair, and the much more expensive extension cables and timers were left, but we were all upset, Finlay, in particular. We had been planning to replace them for next year - but by Christmas eve all the shops seem to have sold out of tasteful large illuminated animals. I don't think it was the taste police as suggested by my brother-in-law! 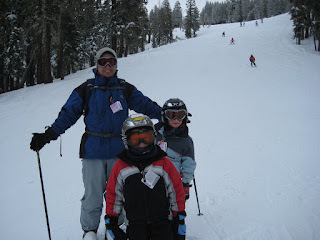 A large storm and a few feet of snow in the Sierras sent us up to Bear Valley for a couple of days. 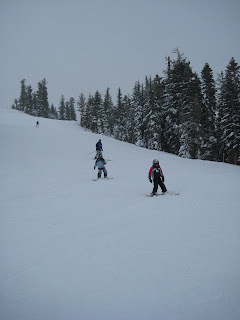 The weather was mixed - wind and snow on Sunday, cold and sunny on Monday. 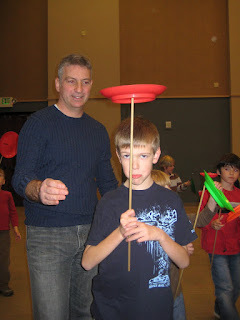 The boys both took lessons and consolidated what they had learned last year. Adam got to try out his new boots and board. He had been earning points for the board and boots by doing his homework well, it has taken since the summer and he is rightfully proud of the achievement. The end of term co-incided with Adam's birthday. 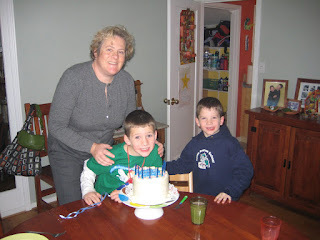 He turned eight and celebrated with his class. 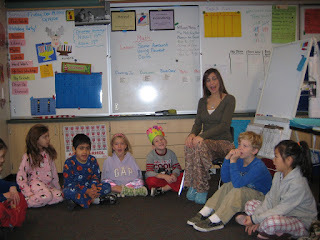 They were having a pajama and breakfast party in the class so they combined that with thier traditional birthday celebrations. After they sang Happy Birthday, Adam read to the class from his favourite book (Horrid Henry), wore the birthday crown, and could cut in line all day. 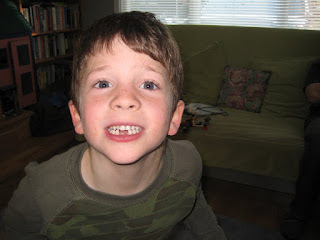 When he came home we ate the birthday cake (banana cake) and Adam chose his favourite dinner (burgers). I treated myself to some hand-dyed cashmere to make a neck-warmer. 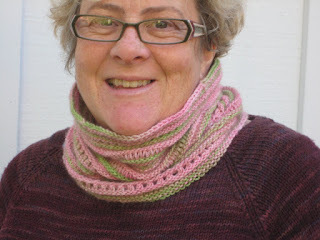 The yarn is Hand maiden 4-ply cashmere in the Rose Garden colour. I used the Beech Wood pattern from Ilga Leja that used to be available as a free pattern on her website. Its was a nice easy pattern which gives a great textured effect, but not so much activity as to overwhelm the handpainted yarn. I chose the colour to coordinate with my green winter jacket and am pleased with the effect. All the boys managed to walk on the ball for some distance and were all very pleased with themselves! 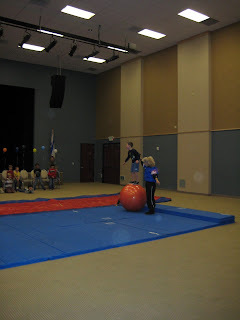 They finished with a giant bouncing walkway for flips and bounces. We wrapped up festivites with cake and ice cream and and glitter painting and then sent home 19 overexcited but exhausted children with juggling sets! 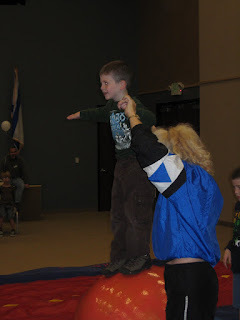 If you are looking for a party location in the bay area I can recommend the JCC parties: we had only to provide drinks and goody bags and were able to walk away from all the mess! I have been doing some knitting - but nothing very exciting. I finished these socks for Nigel in the car on the journey to and from Disneyland. I found him very unreceptive to the idea that he should knit on them while I was driving. The yarn is Pagewood Farms superwash merino in Denim. I bought it in Murphys during our last skiing trip. 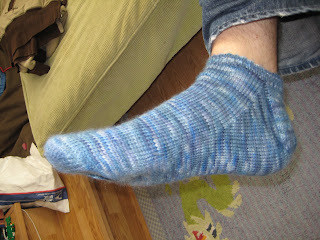 I like the look of these socks, and the finished fabric is very fine, but I didnt like knitting it as it's rather splitty. I spent a lot of time picking up dropped strands. The pattern is the usual, knitted over 72 stitches, with a very abbreviated cuff, as requested. 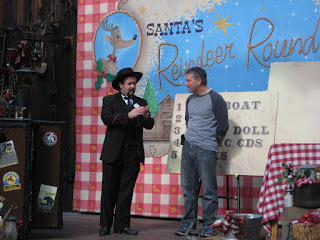 On Saturday we went to the LG Christmas Parade. We have been coming for many years to see the floats, marching bands, baton twirlers etc. 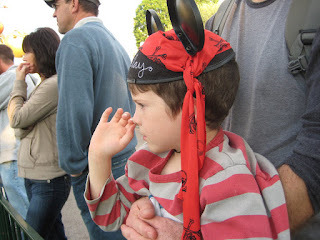 Finlay's first outing to the parade was 6 years ago, when he was aged 4 days. This year, however, we achieved Adam's ambition to actually be in the parade. 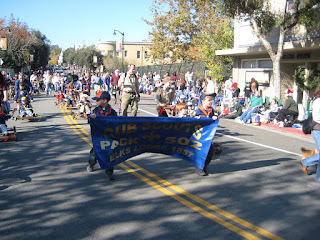 The cubs are well represented with different packs having their own 'themes'. Pack 502 participate on home made and decorated go-karts. The plan had been for Nigel and Adam to go with the scouts, and for me to take Finlay to watch the parade. However Finlay immediately negociated with the scout leader to join in with the cubs and so I saw none of the rest of the parade but the boys had a great time. They particularly loved their friends in the crowd calling out - and waving to other friends who were also in the parade. They swapped about on the karts, but ended up with both our boys on the kart. The parade route was pretty long, and we were a long way back in the running order. By the time we got to Main St Nigel was pushing them both. We revived ourselves with brunch at the California Cafe. 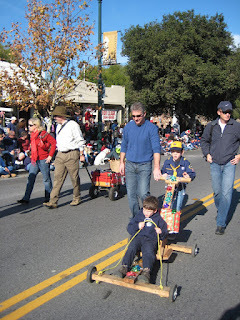 The boys were unanimous that this was the "best parade ever". 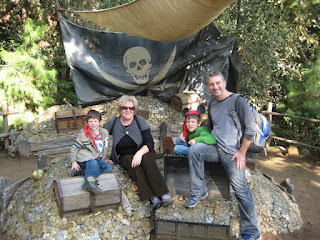 As we have on several previous Thanksgiving holidays we spent the day at Disneyland. It was quieter than we have ever seen before, at least until after the parade when things got busier. 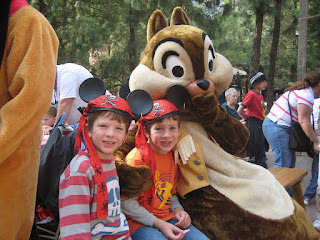 We saw the usual characters...either Chip or Dale actually sat on Adam although I was not quick enough to get a photo of that! 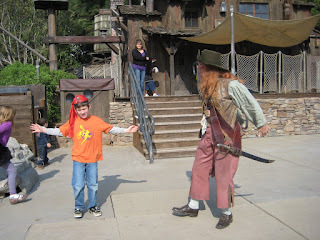 The boys especially loved the pirate island and joined in with the pirate show. and Nigel made it onto the stage for the magic show. 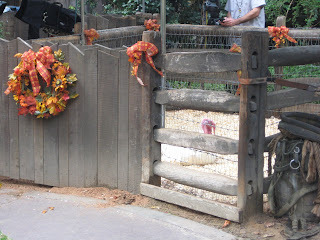 We also ran into this fellow...complete with live reindeer..
and of course it would not be Thanksgiving without the turkey. This fellow is the 'pardoned' turkey 'Pumpkin', fresh from the White House. (Apparently he flew first class from Washington to make it to LA the same day). It was lovely to see the Christmas parade, which included Mickey and Minnie skating on a real ice rink atop a moving float! The parade was Finlay's favourite part. 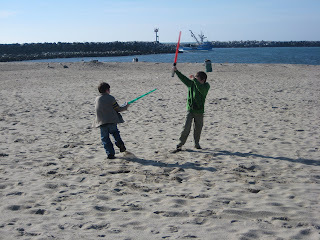 We finished up our little vacation with a stop at the beach where the boys reenacted the jedi show.